Info "Follow the directions on the top screen and spin the dial to crack the safe." Gym Locker is a microgame found in WarioWare: Touched! in the Slightly Unscrewed stage. 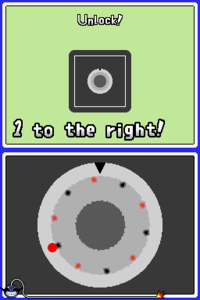 The objective is to spin the dial so that it matches the code shown on the Top Screen. This game has twice the time to complete as most games. 1st level difficulty: The code is two characters. 2nd level difficulty: The code is three characters. 3rd level difficulty: The code is four characters. This page was last edited on April 7, 2018, at 05:05.